* New track; Tracks 2—5 are previously released. * Note: The LP shipped with the album CD included, as well. The first song recorded for the album was meant to be a duet with Willie Nelson, who recorded his vocals at Pedernales Studio in Spicewood, Texas in 2012. “It's still shocking to me,” Blake Shelton told People about his duet with Streisand. “I don't know how [the duet] came down. I don't know how she knows about me, but I'm just glad. I'm just going with it! Streisand and Elvis' paths crossed several times over the years, but they never recorded together. They were the first two stars to open the Las Vegas International Hotel in 1969. In 1975, Elvis was performing in Vegas and Barbra went to see his show. Elvis thanked Barbra from the stage, telling the audience she had “one of the finest voices in the world.” And in 1976, Streisand briefly considered Elvis as her co-star in A Star is Born. This is something that irritates a sector of the Elvis fan community, while other fans see it is a welcome adaptation of a classic, made new again and shared with future generations of fans. Regardless of what side you are on in the debate, you have to admit, it is pretty amazing what can be done with modern technology. In 2017, Sony Music Australia released Streisand - Encore & Partners (The Collector's Edition) [Catalog #0889854240523]. A 2-CD set, this version included both Deluxe Editions of Barbra's Streisand's amazing albums Encore and Partners which both charted very highly on the Australian ARIA charts. The Billboard 200 is a ranking of the 200 highest-selling music albums in the United States, published weekly by Billboard magazine. Below: Barbra at #1. Scan courtesy of Peter Curl. Note: The record company must submit an album to the Recording Industry Association of America (RIAA) where it undergoes a certification process to become eligible for an award. The process entails an independent sales audit, which calculates the quantity of singles or albums shipped for sale, net after returns. The audit surveys shipments to the entire music marketplace, including retail, record clubs, television sales, Internet orders and other ancillary markets. Based on the certification of these shipments, a title is awarded Gold, Platinum, Multi-Platinum or Diamond status. The data here comes directly from official sources, mainly the RIAA online database. Barbra Streisand's Partners album debuted at No. 1 on the Billboard 200 chart, making Barbra the first act to achieve No. 1 albums in each of the last six decades. The duets album sold 196,000 copies in the week ending Sept. 21 according to Nielsen SoundScan. Partners is Streisand's 10th No. 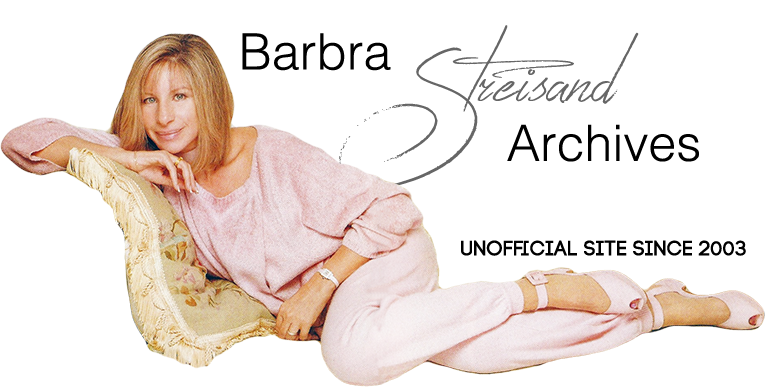 1 album, the largest sales week for a female artist in 2014, and Streisand's biggest sales frame since Higher Ground (it sold 402,000 units in the frame ending Dec. 28, 1997). The Recording Industry Association of America has certified Barbra Streisand's album "Partners" as gold, with over 500,000 sold. This is the 52nd gold in Streisand's career and the most for any female recording artist in RIAA's history. On January 20, 2015 the Recording Industry Association of America certified Barbra Streisand's album "Partners" as Platinum, with over 1,000,000 sold. This wass the 31st platinum album in Streisand's career and the most for any female recording artist in RIAA's history. Below: February 2015, Barbra and her Partners team pose with Platinum certifications. Left-to-right: Columbia SVP Marketing Greg Linn, producer Jay Landers, producer/artist Babyface, Sony U.K. Chairman/CEO Jason Iley, manager Marty Erlichman, Columbia Chairman Rob Stringer, Streisand, Columbia presidentAshley Newton, Sony Music CEO Doug Morris and Columbia EVP/GM Joel Klaiman. Here's more photos from this session with Streisand by photographer Russell James.